Online Sports Betting on your Mobile! 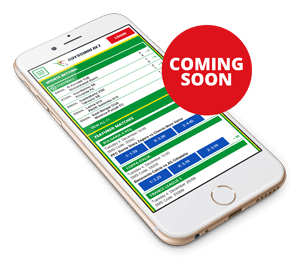 Ethiopias first and only fully licensed Sports Betting App. Founded and created by Ethiopians! Now you can follow your favourite football teams, players and athletes and add to the excitement by simply grabbing your phone and placing a bet in Birr with a payment method you already use. Pre-live betting on your favourite matches. Predict 5 games & crack the jackpot. 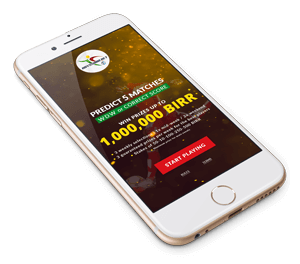 Win up to 1,000,000 BIRR! Predict 5 games & crack the superjackpot. Abyssinia Bet is the first fully licensed Sports Betting bookmaker in Ethiopia. Founded and created by Ethiopians, Abyssinia Bet opens the door to international football and sports for Ethiopian fans. Now you can follow your favourite teams, players and athletes and add to the excitement by simply grabbing your phone and placing your bet. We are honoured and humbled to have been granted the pioneer opportunity of becoming Ethiopia’s first bookmaker. Our mission is clear. We feel committed to prove our No. 1 position to our own customers for many decades to come. Abyssinia Betting , the provider of this website, is licensed by the Ethiopian National Lottery Administration under the Sport betting License Directive No 83/2005 18+ Ethiopian Law Prohibits Betting if You are Under 18 years of age. Do not consider gambling as a way of earning money, and only play with money that you can afford to lose. Gamble responsibly and in moderation.